Fire Detection in Warehouse Facilities Dinaburg Joshua, Gottuk Daniel T.
Auteurs : Dinaburg Joshua, Gottuk Daniel T.
Automatic sprinklers systems are the primary fire protection system in warehouse and storage facilities. The effectiveness of this strategy has come into question due to the challenges presented by modern warehouse facilities, including increased storage heights and areas, automated storage retrieval systems (ASRS), limitations on water supplies, and changes in firefighting strategies. The application of fire detection devices used to provide early warning and notification of incipient warehouse fire events is being considered as a component of modern warehouse fire protection. Fire Detection in Warehouse Facilities provides technical information to aid in the development of guidelines and standards for the use of fire detection technologies for modern warehouse fire protection. The authors share their thorough literature review, analyze characteristic fire hazards for modern warehouse facilities, and identify information gaps in the field. 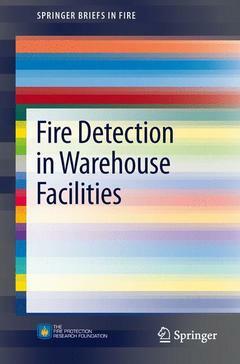 The book concludes with recommendations for the development of guidelines and standards for the use of detection technologies in warehouse fire protection design, including a research plan for implementation. This book is intended for practitioners seeking an understanding of the issues surrounding warehouse design and fire protection. The book will also prove valuable for fire hazard researchers and those involved with fire department response, applicable detection systems, and fire growth suppression. Background.- Objective.- Approach.- Literature Review.- Fire Hazard Analysis.- Research Plan.- References. Bibliography of Additional Sources.